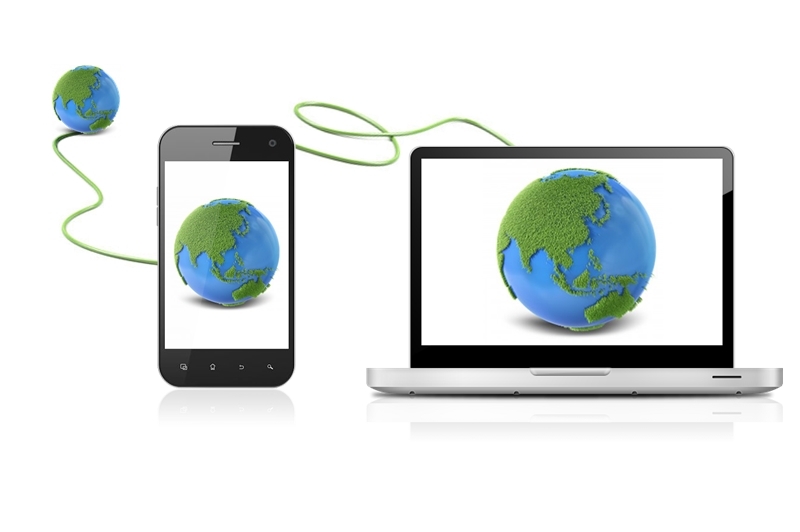 Sometimes we face a situation when we have an only mobile data connection available but we need to use the Internet on our laptop, netbook or PC as well. So we may share mobile internet to our computer. It’s the most stable and most economy way. We will have wired connection with PC and don’t depend on any other radio interference. But if the phone is needed by someone else or should be placed in our pocket it’s better to use the below methods. We won’t lose power on mobile. A USB cable is required and it should be included with our mobile device. It’s the easiest and common way that gives the ability to connect other mobiles, Xbox’s, laptops to our mobile Internet. It increases the usage of battery power. It requires having a Wi-Fi adapter on the computer. Most modern laptops and netbooks have preinstalled adapters instead of PCs. We can find such separate adapters in any computer shops at a low price. We recommend using USB adapter that gives the option to use it with many devices. But there are PCMCIA (for laptops) and PCI (for PCs) adapters. So we may choose the appropriate type. It’s used when both above options are unavailable. It requires having Bluetooth adapter on the computer (as in the situation with Wi-Fi adapter). Remind that do not place we mobile so far from the computer due to the average distance of this type of connection in the real environment should be less than 10 meters. This three types of Android sharing are grouped in a feature named “Tethering & portable hotspot”. The settings may be found in the “Settings\More\Tethering & portable hotspot\Portable Wi-Fi hotspot” or similar place that depends on different versions of Android. Ensure that Wi-Fi hotspot (tethering) is enabled. Setup Wi-Fi password and name for using it to connect our Mac or Windows computer to this Wi-Fi network. In later versions of Android, the name is given from the device name. Ensure that the Android USB tethering is enabled. Connect the Android device via USB cable to the computer. Windows operating system should automatically install necessary software drivers and mobile will appear as the separated network connection. Mac will connect to our mobile. We can check this by click on the Wi-Fi icon in the menu bar and choose “Open Network Preferences” and see that network is connected via our android. Notice that the HoRNDIS driver should be installed before for visibility of our android device. Ensure that the Bluetooth tethering is enabled. Pair the android mobile and computer via Bluetooth and select this connection as a network on the Mac or Windows according to our operating system. Eventually, now we able to use our phone or tablet as a modem in Android. 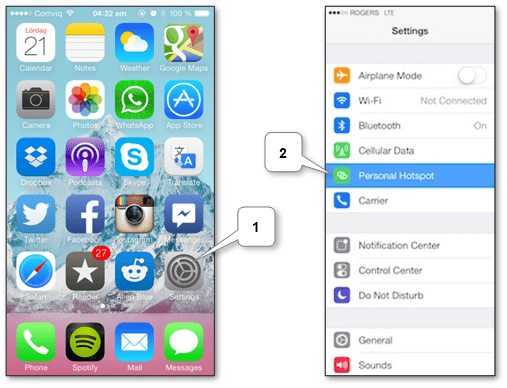 There is a special feature on Apple mobile devices named “Personal Hotspot” covers all three types of connection. The corresponding settings are located in “Settings\Cellular Data\Personal Hotspot”. Note that if this setting can’t be found the device is unable to detect cellular connection or SIM card isn’t inserted or doesn’t work. Check external name for the connection trough device name. Ensure that Personal Hotspot is enabled. If request appears while enabling we may choose “Turn on Wi-Fi and Bluetooth”. But we always can turn Wi-Fi separately. Check the Wi-Fi password and use it to connect the Windows or Mac computer to this Wi-Fi network. Ensure that Personal Hotspot is enabled. If request appears while enabling choose “USB only”. Connect the mobile device via USB cable to the computer. Windows operating system should automatically install necessary software drivers and mobile will appear as separated network connection as same as on Android. Mac will do all automatically. We can check this by click on the Wi-Fi icon in the menu bar and choose “Open Network Preferences” and see that network is connected via USB mobile. Ensure that Personal Hotspot is enabled. If request appears while enabling we may choose “Turn on Wi-Fi and Bluetooth”. But we always can turn Bluetooth separately. In Windows operating system we should pair and set the mobile as an access point if necessary. After Mac pairing, it will do all automatically as in case of USB. Now we can use our iPad or iPhone as a gateway to browse the Internet on our computer. 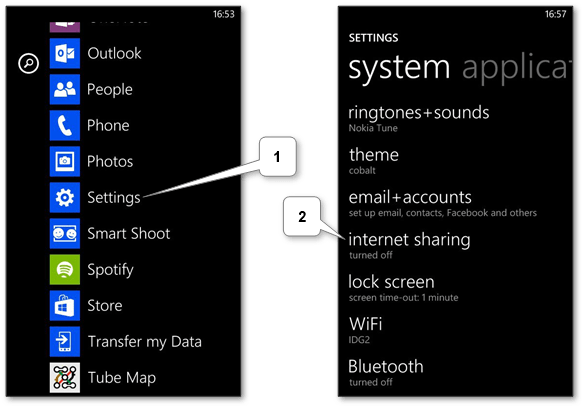 This feature is named “internet sharing” and located in “App list\Settings\internet sharing”. Ensure that “internet sharing” is enabled. Notice that if our mobile data provider doesn’t support tethering usage the error message will be shown. Check the name and password for the Wi-Fi network by click on the Setup button. In later versions of phone models, the name is given from the device name. Use this network name and its password to connect Windows or Mac computer. There is a little trick for a case that the mobile data provider doesn’t support tethering. Install any proxy software (e.g. Tether-X) on our phone. Establish own Wi-Fi network on the computer. Connect Windows Phone to created network and check that proxy is started (in the Tether-X app select “Start Proxy Engine”). On the computer setup proxy with IP address of our phone (we may find out it by clicking on connected Wi-Fi network) and 8080 as a port. Do not forget to return proxy settings back after finish work. Now our PC is able to browse the Internet via the mobile connection. Unfortunately, there isn’t a standard way to do this. But there are some tricks like this that might be helpful for us. Note that this feature is available starting with Windows Phone 8.1 Update 1. 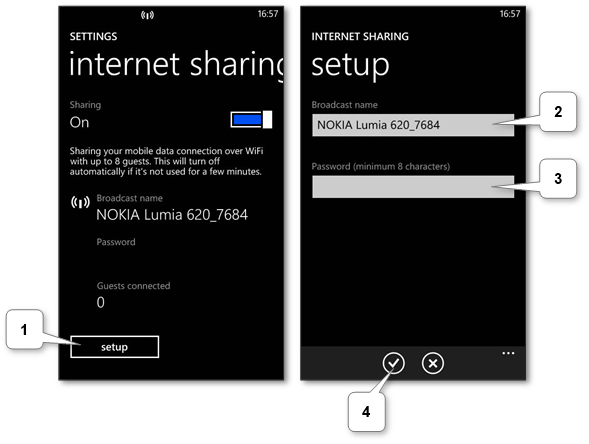 Ensure that “internet sharing” is enabled and choose “Bluetooth” in “Share over” section. Make sure that the mobile and the Mac or Windows computer are paired via Bluetooth. Now we can use our Windows phone as a modem to browse the Internet.